Archive for the ‘VMWare’ Category. Is Windows 8 Pro Hyper-V the end of VMWare Workstation? So I have had a license for VMWare Workstation through work since 2004. I have been a loyal user for eight years. However, my current job is not going to provide any further VMWare Workstation licenses. you are only looking at over $125.00 on sale (normally $199). VMWare Workstation alone is $249. VMWare Workstation is $50 more expensive than paying full retail price for the full version of Windows 8. If you are planning to buy Windows 8 Pro anyway, then technically, VMWare Workstation $249 too much. Having used both, I am going to mention some differentiating features. Hyper-V virtual machines seem to snapshot and revert must faster than VMWare Workstation. VMWare auto sizes the screen does, Hyper-V doesn’t. VMWare workstation has a cool mode where you can run apps from the virtual machine as if they were regular desktop apps. VMWare workstation works better with alternate operating systems. There are advanced features that I haven’t tested. For example, when I worked at LANDesk we need to test PXE Booting so the ability for the virtual machine to PXE Boox was extremely important, and VMWare worked really well with PXE Booting. I haven’t tested Hyper-V with PXE Booting, so if you have please post and let me know if how it works. Of course, don’t forget about Virtual Box. 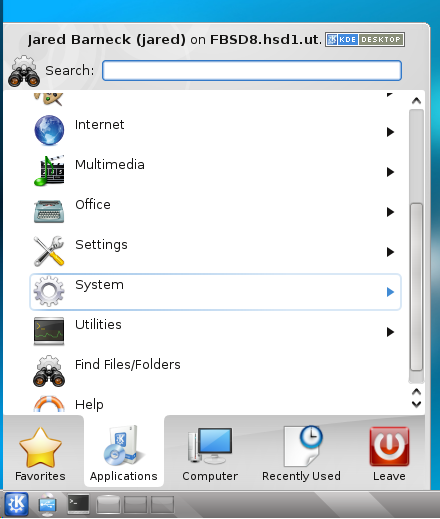 The open source edition, Virtual Box OSE, is free no matter what operating system is the host, whether it is Windows 8 or FreeBSD or Linux. It has been free for a while and yet VMWare Workstation is still popular so maybe it will remain popular despite Windows 8 Pro? I don’t know if you, like me, have a development box running Visual Studio 2010 and VMWare workstation. I develop in C# and WPF, and test the product in a VM. Then sometimes, when I work from home, I remote desktop into my development box. When I am using RDP to remote control a VMWare Workstation host, and I run a WPF Application inside a VM, the WPF application doesn’t display. The window opens, and you see the frame of your windows, but the inside is just blank or a white/gray box. 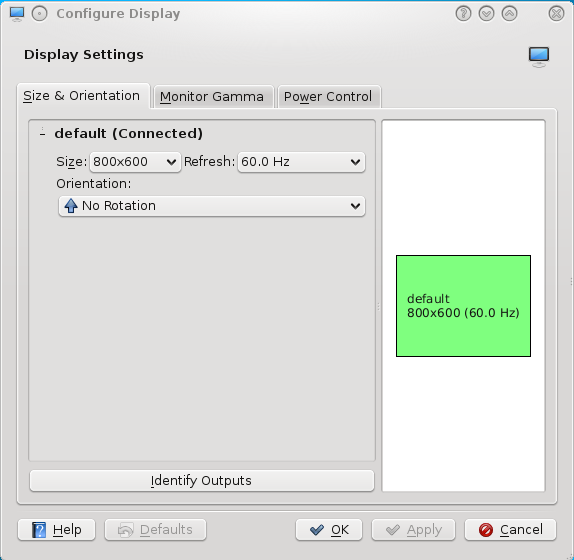 None of the WPF Controls are visible. I have found two ways to fix this. One is permanent and one is temporary. Option 2 – (Temporary) Or just reboot the VM while connected to the VMWare Workstation host via RDP. It seems that the VM boots and the OS detects the lack of support and disabled hardware acceleration. However, once you reboot when you are not RDP’ed into the VMWare Workstation host, you have hardware acceleration back. I took me a long time to figure this out, because there was little to nothing in a Google search. I came across this solution while looking for something else a month or so ago, and needed to use it again when working from home last night. I thought I would post it so I never have to look for it again. This happens whether you are using VMWare or VirtualBox. It also happened back when we were re-imaging to “revert” our drives. This is caused because the Machine creates an account on the Domain. It actually maintains its own password and updates its own password every 30 days. So as soon as the Machine account’s password is updated, you are going to be in this state. It mentions a possible option. While he mentions that it can be done, he doesn’t mention how to do it. There is a Microsoft Knowledge-base article about this. This is a WIndows 2000 article, but I will have to verify that it works in later versions. So I am going to try the first one, as it doesn’t require a global setting on the domain. Lets see if it really works. I put the first registry key on all my VMs back when this was posted, which looks like October 22, 2010. I haven’t had the problem since, so I would say this solution works. I don’t know if the second key that goes on a Domain Controller works. Maybe some one can try it out for me. Ok, so because my work has given me a license to VMWare Workstation, I have never really gone to the trouble of using VirtualBox. But I really want to move to use FreeBSD (well, PC-BSD) on my laptop but I have to have a Windows 7 box for work. So I had Windows 7 with PC-BSD in a VMWare Virtual Machine. However, I am switching that as we speak. I now have PC-BSD installed as my primary operating system, and Windows 7 in a VirtualBox Virtual Machine. There are some features we use at LANDesk a lot, such as many snapshots, and PXE booting, and more. I will test and follow-up on whether this is a good solution for me. Why does VMWare guests lose network access constantly on Windows 7 64 bit? Well this issue didn’t happen from the middle of December until last week, it started again. I toggled a bunch of settings, but every setting is correct. There must be something else causing this. Update: Found this. I will set my NIC to not go to sleep and see if that works. Seems like a bug to me. Yeah, my computer went to sleep anyway, and with that setting, I couldn’t wake it up remotely. Lame. 2.1.6 beta 6 addresses this issue, so please install this version and ignore the rest of the comments below. Ok, so I am big support of ShrewSoft VPN Client and I am also a user of VMWare Workstation. However, I have found an incompatibility between the two. I tell everyone here at work to use ShrewSoft VPN Client on their Windows 7 64 bit clients. However, they are all running VMWare as well. So I feel it is my responsibility to also inform them of this issue that was found by one of my coworkers. Well, a strange problem is seen on VMWare Guests running on a host with ShrewSoft VPN Client installed. No DNS requests are going out for the Guest. A DNS Request never leaves the host. If you stop the ShrewSoft DNS Proxy Daemon, then the issue goes away. Also, this is not really a reason to stop using ShrewSoft VPN. There is a post about Cisco’s VPN Client firewall causing the same issue. 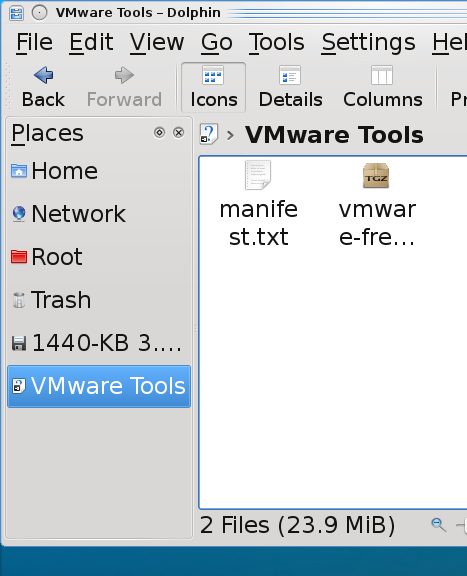 How to install VMWare-tools on FreeBSD 8 or PC-BSD 8? This guide is to walk you through resolving the second of these two issues. I assume you followed my article for building the FreeBSD desktop, and if you did, these steps will work for you. But if you didn’t, I can’t guarantee that there won’t be some steps that are slightly different for you. Time Synchronization (the time in the VMWare guest will match the hosts time). In this document, I successfully get these features working. I have VMWare Workstation 6.5.3 build 185404 and the host is Windows 7. On the VMWare hosts make sure that your FreeBSD guest is selected and that you are not full screen so you have the VMWare Workstation application surrounding the FreeBSD guest. From the VMWare Workstation application, choose VM | Install VMWare tools…You will see a pop-up inside FreeBSD on the bottom left. 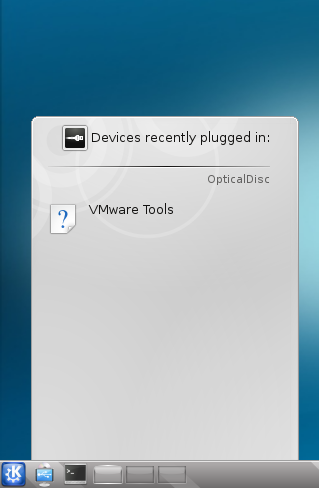 Click on the popup where it says VMWare Tools. This will open Dolphin file browser. In the Dolphin file browser on the bottom left, you should see the VMWare Tools media. Click on it. Right click on vmware-freebsd-tools.tar.gz and choose Extract Archive to… Now you can extract to where you want, as long as you have the folder permission to write to, but the next steps describe where I extracted it to. Click on Home at the left. There is no need to create a folder as the extacted files will all be in one folder called vmwware-tools-distrib when extracted. Click OK. The vmware-freebsd-tools.tar.gz is extracted. Cick K | Applications | System | Konsole to open the shell. Step 4 – Install the freebsd6 compatibility package. Determine your architecture or processor type. If you are 64 bit, it will be amd64 even it is intel 64 bit. If you are 32 bit, it is likely x86. Type uname -a to determine what your architecture is and look at the last piece of information provided. Install the compat6x-[arch].tgz package, where you replace [arch] with your architecture. This is already installed on PC-BSD. Change to the directory where you extracted the vmware-freebsd-tools.tar.gz. Just keep hitting enter and accepting the defaults until the vmware-tools are installed. Or you could just reboot. Note: Since vmware-tools doesn’t exactly integrate with rcNG, you don’t need to add anything to /etc/rc.conf. The just dump a script into /usr/local/etc/rc.d and it is just a shell script and isn’t formatted to require it to be enabled by /etc/rc.conf. The vmware-user process must be launched to enable vmware-user features. Configure vmware-user to run at KDE login by copying the /usr/local/bin/vmware-user shell script to the ~/.kde4/Autostart directory. You could also create a symlink. Note: You don’t have to use the command. In the System Settings under Advanced |Autostart there is an option to Add Script that you can use. 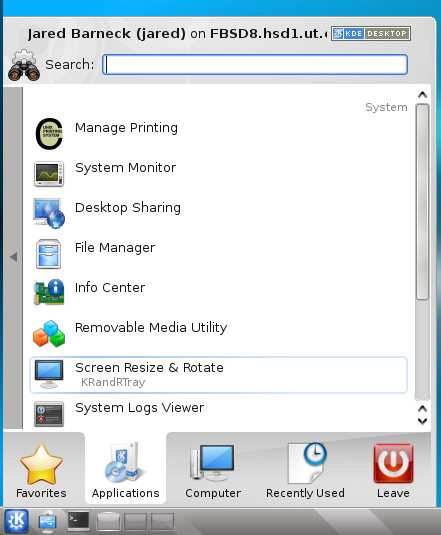 Logout of KDE and log back in. There may be some vmware settings you want to change on the VMWare guest. Not many are configurable through the vmware-toolbox on FreeBSD but at least one is configurable here called Time Synchronization. This feature will synchronize your vmware guest’s time with the hosts time. Feel free to explore and become familiar with the other settings, there aren’t many and two of the settings can only run as root. I found a lot of tuning recommendations. However, if you chose Other | FreeBSD or Other FreeBSD 64 when creating your vm, these first two are set by default. It is recommended to have kern.hz set to 100 and it is by default so nothing to do here. Again, if you chose Other | FreeBSD or Other FreeBSD 64 when creating your vm, this is set by default. However, this is the same as the time synchronization setting we configured with the vmware-toolbox. It is safer to make the configuration in the vmware-toolbox tool. If you know of any further tuning options, please comment them to me. My VMWare guests lose network access constantly on Windows 7 64 bit. This happens sometimes within an hour and sometimes longer. I haven’t really tracked that well. The first step to troubleshooting is identifying the problem…then next is gathering data, so lets analyze what I have. Do I need three networks? Could that be problematic? According to this article it could be on Vista 64 bit, and that may hold true for Windows 7 64 bit. Ok, so I really only need VMNet0 as I always plan to bridge in this environment. In other environments I might not though. I also have never remove these, but I am going to try it. Note: I deleted those using the Virtual Network Editor | Host Virtual Adapters tab. So I started looking at settings to see if there is a setting that doesn’t look right. My problem may be the Automatic bridging settings, since mine is disabled and VMNet0 was configured to use the wireless adapter. I am only using the Ethernet adapter but even though it is a desktop, my PC came with a wireless card, which I am not going to use. 1. On the Virtual Network Editor | Automatic Bridging tab, I unchecked the automatic bridging option to disable it. 2. On the Virtual Network Editor | Host Virtual Network Mapping, changed VMNet0 to to be statically mapped to my physical wired Ethernet controller. 3. In windows, I went to my network settings and disabled my wireless network card, since I am not going to use it. So here goes the test…lets see if my VMWare guest operatings system lose their networking capability. Well, my network wasn’t working last night…so I would have to say the steps above didn’t NOT resolve the issue. Time to continue troubleshooting. I now have configured the vmnat.exe and vmentdhcp.exe to be allowed in the firewall always. So the three networks somehow came back. I removed them again and this time they stayed gone. This was about a month ago and my virtual hosts’ haven’t lost network access since.